Parsley originally came from Sardinia, but has been widely cultivated in many other countries. Parsley is a very hardy perennial herb that seeds itself easily and over winters well. Parsley prefer well worked and damp soil, with partial shade. Plant seeds in early spring, around 1/2″ deep, and a foot apart. If purchasing plants, they should be planted at the same level they are in the pot they came in. Allow parsley plenty of room to grow. Toward the middle of summer parsley can become a little woody. If this occurs cut back the leaves and plants. This will encourage new growth, and make sure you water well. 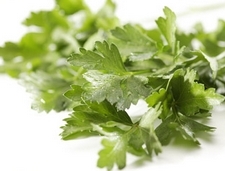 Parsley is used fresh, finely chopped, in herb mixtures, sauces, soups, stews, egg dishes. It dries well, and like most herbs, should be air dried out of direct sunlight. The stems and branches are used both for the fresh product and for the dried one. The root or seeds, when made into a strong tea, is good for a kidney tonic and aid in passing kidney stones. The leaves are calming to the stomach and great for freshening the breath. Parsley contains many vitamins and minerals, such as iron, and should not be thought of as a simple garnish to make dishes look more colorful. The flavor is not strong, but it is a good addition to food dishes. It makes a very attractive border or flower bed plant, and can be grown among flowers, as a decoration.